Exclusively available on the AT&T network in the US, the Windows Phone 7.5 based Nokia Lumia 900 is a scaled-up version of the Lumia 800 with a few extras thrown in. Although the 900 and 800 look very similar, the display on the Lumia 900 is now a 4.3" 480 x 800 pixel ClearBlack panel, which is significantly larger than the 800 (although it has the same resolution). The Lumia 900 also supports LTE (4G) data along with a variety of HSPA+, UMTS and GSM/GPRS options. From the technical specifications, the Lumia 900 could easily be a world phone, but AT&T seem to have it available only to them.. for now. Inside is a 1.4 GHz CPU with 512MB of RAM and 16GB of non-expandable flash memory. On the back is an 8 megapixel camera with 720p HD video capture capabilities, and the Lumia 900 also has a front-facing camera for video calling. 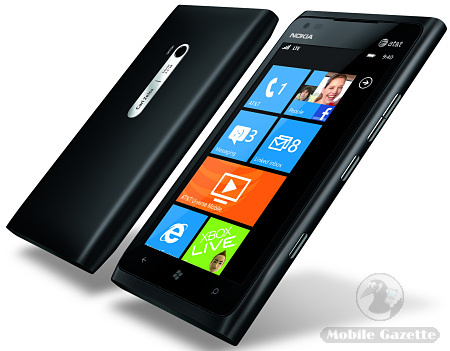 WiFi and Bluetooth connectivity are also included, and the Lumia 900 comes with GPS and turn-by-turn navigation. LTE gives download speeds of up to 50 Mbps, or alternatively if LTE is not available and HSPA+ is then you can get up to 21 Mbps downloads instead. 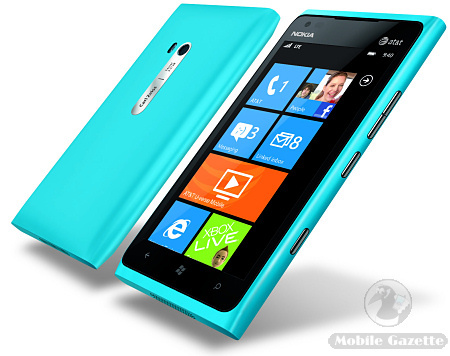 The Lumia 900 has a specially designed antenna array to avoid interference when using high-speed data. Inside is a very large 1830 mAh battery, and the Nokia Lumia 900 measures 5.0 x 2.7 x 0.45 inches and weighs 5.6 ounces (or 128 x 69 x 12mm and 160 grams). There are two colours available at launch, black and cyan. Nokia's market share in the US at the moment is basically zero, and this is a determined attempt to break back into this important market. Nokia have managed to come up with something distinctly different from other smartphones here, but it remains to be seen if consumers will be impressed.